Shelter 307 is one of the bomb shelters that were built during the Spanish Civil War to protect the population from the indiscriminate bombing to which Barcelona was subjected. It was excavated thanks to the efforts of the population of the Poble Sec district. It is one of the more than 1,000 bomb shelters built in Barcelona during the Spanish Civil War, and is a good example of passive defence in the city, in which the Republican Army, the Generalitat de Catalunya (Catalan Government), the City Council and the people of Barcelona all played a part. 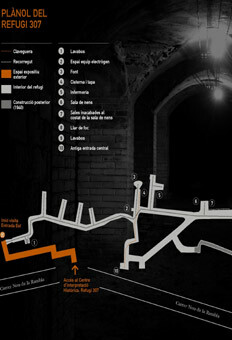 The shelter has three entrances onto Nou de la Rambla street, and comprises nearly 400 metres of tunnels, with a height of 2.10 metres and a width of between 1.5 and 2 metres. It has a number of different facilities, including a toilet, a water fountain, an infirmary, a children's room and a fireplace. Visitors can imagine the anguish suffered by the people of the city during the Civil War, when they were forced to face a new phenomenon: the bombing of the civil population, a military practice that had only been briefly tried out during the First World War, and the fact that Barcelona was being used as a test city for the bombing of civilians that would perpetrated during the Second World War in the rest of Europe. Shelter 307 is one of the finest examples of a bomb shelter built in Barcelona, and has now also become a veritable memorial to the people's struggle to survive in the face of adversity. As they make their way through the shelter, visitors can experience what it must have been like to spend time within these walls. They can see the different rooms in the shelter, such as the toilets, a water fountain, an infirmary, the children's room and a fireplace. Even though the tunnel is only 200 metres long, the initial plan was to build a shelter over 400 metres long, which could have provided refuge for around 2,000 people. During the tour, visitors can also see the remains of constructions subsequent to the Civil War, when the shelter was reused for other purposes. The bloodiest bombardment that Barcelona would suffer during the Civil War began on 16 March 1938, at 22:08. It lasted for almost 3 days, killing and injuring over 1,000 people, and destroying 45 buildings and damaging 75 more. Barcelona was a test site for a practice that had only been briefly tried out during the First World War: the indiscriminate bombing of the rearguard. It caused chaos among the city’s inhabitants, children were sent to safe places if possible, and the whole morale of the city began to collapse, thus helping to make Franco's victory even more overwhelming. After the first bombardments, the Junta de Defensa Passiva (Passive Defence Council) was created, in addition to several Juntes de Defensa Local (Local Defence Councils), which took measures to try to deal with this lethal new military strategy. First of all, cellars in houses were fitted out as shelters, as was the Metro system. Despite the lack of resources available, the Generalitat, the City Council and the people themselves organised their defence: alarms were installed, a food, water and medicine supply service was set up, and new shelters were built, despite the scarcity of necessary materials such as iron. When the alarms sounded, all the lights in the city would be extinguished, and everyone had to run for their lives. If you did not have a shelter or a Metro station close to hand, then the best thing was to hide on Collserola or another of the city's hills. Sundays: guided tours at 10.30, 11.30 and 12.30. Limited number of places available. We urge visitors to reserve in advance. Entrance without charge: Barcelona Card and 'Gaudir +' promotion.